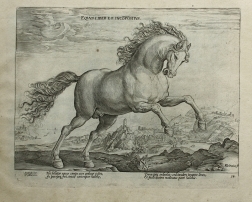 STRADANUS, Joannes (1523-1605) - Equile, seu speculum equorum, in quo omnis generis generosissimorum equorum ex variis orbis partibus insignis delectus. Antwerp: Johannes Galle, c.1600. (300 x 395 mm). Engraved title and 39 engraved plates. Plautilla Bricci (Roma 1616 - Roma 1705) and Gian Lorenzo Bernini (Napoli 1598 - Roma 1680) (workshop) - La Pianta della Villa Benedetti a Roma. (c.1664). Daniel Marot[workshop] - Design for a carriage coupé, shown from the side. 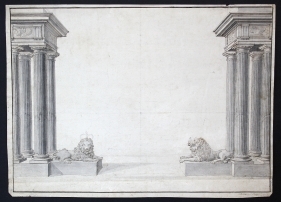 FISCHER VON ERLACH, Johann Bernhard - Design for the gateway of Schloss Klessheim near Salzburg. c. 1700. Armorial manuscript. France or Belgium, n.d. (17th century) folio. 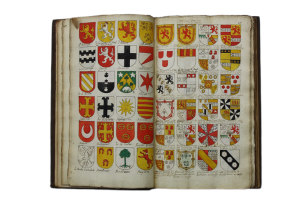 214 numbered pages with 4180 drawings of coat of arms, most of them hand-coloured. Blind tooled leather with gilt lettering and ornaments on spine.